Dan Yurman looks at how small nations are trying to increase their nuclear supply. Romania has the US and China both pitching for business. The Czech Republic is still vague about giving electricity price guarantees, something that caused the collapse of a $25bn nuclear tender in 2014. Ukraine looks at Small Modular Reactors. 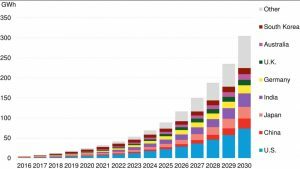 The author starts with the Baltics – net importers of electricity – and Estonia’s ambition to redress that balance using the new Moltex molten salt reactor. He goes into detail about its design: run on existing depleted nuclear fuels, and much safer (air-cooled, non-pressurised). Five small nations are moving ahead with plans to develop their own nuclear power stations. Two of the efforts involve U.S. developers of small modular reactors (SMRs) Here is a round up of recent news items. (WNN) Fermi Energia of Estonia has selected Moltex Energy as its preferred technology for its plans to establish carbon-free energy production in the Baltic region. Moltex Energy said this week that the two companies had signed a Memorandum of Understanding (MOU) which states their intention to work together, including a feasibility study for the siting of a Moltex advanced reactor and the development of a suitable licensing regime. In its statement, Moltex Energy noted that Estonia generates the majority of its power from oil shale, but that this fossil fuel capacity will have been mostly retired by 2030. Wind power in the Baltic provides some potential, but the country needs an alternative, reliable power source if it is to remain self-sufficient in energy, it said. 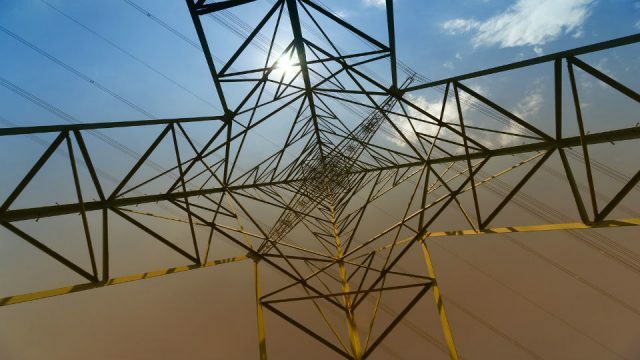 Estonia’s neighbours Latvia, Lithuania and Finland are all net importers of electricity. The intent of the MOU is to create a source of clean and safe power generation in Estonia which would represent an improvement in energy security for the whole region. 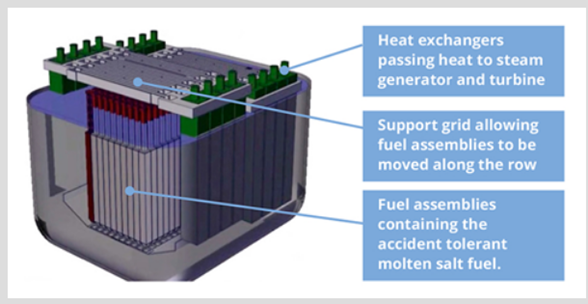 UK-based Moltex Energy announced in July last year that it will build a demonstration SSR-W (Stable Salt Reactor – Wasteburner) at the Point Lepreau nuclear power plant site in Canada under an agreement signed with the New Brunswick Energy Solutions Corporation and NB Power. The firm is also pursuing market opportunities in the UK. 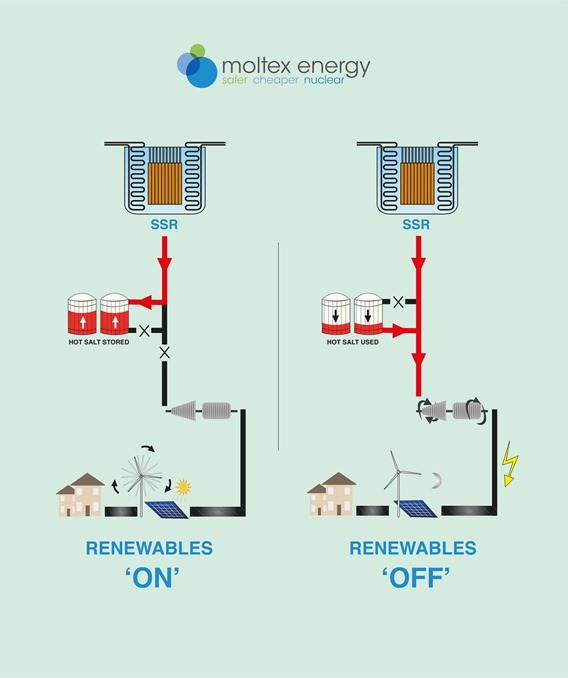 Moltex Energy’s SSR is a conceptual UK reactor design with no pumps (only small impellers in the secondary salt bath) and relies on convection from static vertical fuel tubes in the core to convey heat to the steam generators. The fuel assemblies are arranged at the centre of a tank half filled with the coolant salt which transfers heat away from the fuel assemblies to the peripheral steam generators, essentially by convection. Core temperature is 500-600°C, at atmospheric pressure. The tank is filled with a safe molten salt coolant, which is not pressurised like gas or water coolants in today’s power reactors and not violently reactive with air and water like sodium in today’s Fast Breeder reactors. A second similar coolant salt system takes heat from the primary coolant salt to a patented GridReserve energy storage system. GridReserve is a collection of molten salt storage tanks that stores gigawatt scale thermal energy when it’s not needed for electricity production. When demand goes up, say when renewables are off, the plant can take heat from the reactor and storage tanks to produce electricity. This is just like in a Concentrated Solar Power plant and uses the same solar salt, turning a 1GW reactor into a 3GW peaking plant. The GridReserve system appears to be a form of “load following,” but not from the reactor itself, but from the stored heat in the secondary salt loop. This approach removes the burden of managing the reactor for this purpose. Refuelling is simple: Fuel assemblies are simply moved sideways out of the core and replaced with fresh fuel assemblies. This results in a near on-line refuelling process. The entire construction is simple, with no high pressure systems, few moving parts, and no Pressure Vessel needing specialist foundries. The reactor is continuously cooled by natural air flow, giving complete security against overheating in an accident situation. See this video for a “fly through” of the design. The firm claims on its website that multiple versions of Stable Salt Reactors are possible. The first being developed now is a “waste burner.” This uses fuel produced by a new, low cost and very simple process from spent conventional reactor fuel. Reduction in the radioactive life of the majority of that spent fuel from hundreds of thousands of years to just a few hundred years will effectively clean up a large part of the hazardous residue of the first nuclear era. 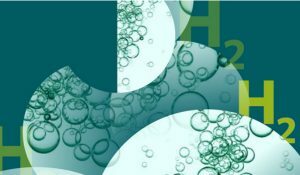 A second generation Stable Salt Reactors design will be able to breed new nuclear fuel from depleted uranium and thorium. The firm also proposes to develop a graphite moderated option to use conventional enriched uranium as fuel. (WNN) An agreement was inked this week between US small modular reactor (SMR) developer NuScale Power and Romanian energy company Societata Nationala Nuclearelectrica SA (SNN SA) to explore the use of SMRs in Romania. The two companies have signed a memorandum of understanding (MOU) covering the exchange of business and technical information on NuScale’s nuclear technology, with the goal of evaluating the development, licensing and construction of a NuScale SMR for a “potential similar long-term solution” in Romania. SNN SA, also referred to as Nuclearelectrica, operates two Canadian-supplied CANDU units at Cernavoda that currently generate up to 20% of Romania’s electricity. The reactors use natural uranium and heavy water to achieve criticality. No enriched fuel is needed to run the reactors. 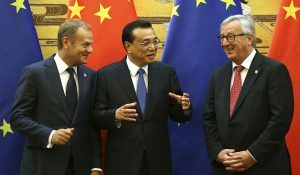 Romania has been in negotiations with China since 2016 for development of two new CANDU type nuclear reactors. Some work that has already taken place on the CANDU Units 3 & 4 would be a springboard for completion by China General Nuclear Power Group (CGN). NuScale’s SMR technology features the self-contained NuScale Power Module, with an output of 200 MWt or 60 MWe each for a total in a 12-unit installation of 720 MWe. Based on pressurised water reactor technology (PWR), the scalable design can be used in power plants of up to 12 individual modules. The technology is currently undergoing design certification review by the US Nuclear Regulatory Commission. The Utah Associated Municipal Power Systems is planning the development of a 12-module plant at a site at the Idaho National Laboratory, with deployment expected in the mid-2020s. NuScale has released information on the cost-competitive nature of its SMR. The firm said on its web site that the estimated construction cost for the first NuScale 684 MWe (net) plant is about $3 billion which works out, in round numbers, to $4400/Kw. The firm also said that total construction time, to mechanical completion, but not commissioning, would be 54 months. In July 2018 the firm released information saying that it was working on further cost savings with a target cost of $4200/Kw. By comparison, CGN’s cost estimate for completion of the partially built twin CANDUs, at 720 MWe each, would come in at $5070/Kw. NuScale has also signed MOUs to explore the deployment of its SMR technology in Canada and Jordan. All of these agreements are highly conceptual and don’t involve, at this stage, any significant financial commitments. (WNN & wires) Holtec International has made progress with its work on an SMR-160 system through agreements with Energoatom and Exelon Generation announced during the winter meeting of the Holtec Advisory Council for SMR-160, held in February 2019 in Jupiter, Florida. Holtec is a private firm and keeps details of its development efforts closely held. So, the news about the meeting of its advisory committee represents a rare look at progress on the 160 MW SMR. The SMR-160 reactor is under review by the Canadian Nuclear Safety Commission and is in Phase 1 – Pre-Licensing Reviews -of the three-phase evaluation cycle. The SMR field in Canada has become highly competitive with nine other reactor vendors also in process for similar reviews. Two SMR developers have completed the Phase 1 process. State Nuclear Regulatory Inspectorate of Ukraine, the nuclear regulatory authority in Ukraine, is expected to coordinate its regulatory assessment of SMR-160 under a collaborative arrangement with its Canadian counterpart. Energoatom President Yury Nedashkovsky announced plans to establish a consortium with Holtec and Ukraine’s national nuclear consultant, State Scientific and Technical Centre for Nuclear and Radiation Safety (SSTC-NRS). It will explore the environmental and technical feasibility of qualifying a ‘generic’ SMR-160 system that can be built and operated at any candidate site in the country. A formal announcement of the adoption of the terms of engagement for the consortium is expected later this year. At the same meeting, Holtec signed a memorandum of understanding with Exelon Generation, adding Exelon to the SMR-160 team, which currently includes SNC-Lavalin and Mitsubishi Electric. Under the terms of the MoU, Exelon Generation plans to support SMR-160’s market acceptance, develop a generic deployment schedule and staffing plan, and assist to improve its operability and maintainability features. As SMR-160s are built around the globe, Exelon Generation could provide reactor operating services to customers that lack an established nuclear industrial infrastructure. This approach may facilitate entry in to markets in small countries that otherwise might not be ready to adopt SMRs as part of their energy mix. Holtec describes the SMR-160 as a “passive, intrinsically safe, secure and economical” small modular reactor that has the flexibility to be used in remote locations, in areas with limited water supplies or land, and in unique industrial applications where traditional larger reactors are not practical. 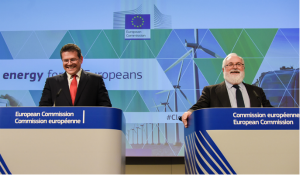 Buy out the minority institutional investors in CEZ, the state owned electric utility, to cut off the prospect of lawsuits that might interfere with the project. Even so the government expects to sign a contract with majority state-owned CEZ to build one or more new reactors at Dukovany, with a tender towards the end of 2020 and with a supplier chosen by 2024. Babis said the government would not provide CEZ an unlimited state guarantee and that the utility would cover any extra costs not generated by the state regulators. The government has been considering how to fund a multi-billion-dollar expansion of CEZ’s nuclear power plants, before some units reach the end of their lifetime. Efforts to complete a previous tender for up to five new reactors, including several at Temelin, worth up to $25 billion, collapsed in 2014 when the government informed bidders it would not offer rate guarantees for electricity sold by the nuclear power stations. 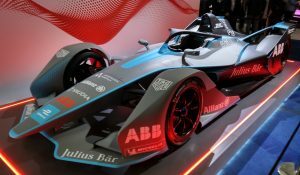 will be interesting if we ever see a working prototype of such designs, or if they will remain in fairy tale land.